A Periodic Table in an Earth Science Context. For each naturally occurring element, the chart provides examples of minerals, crystals, or astronomical objects that contain the element in question. Man-made elements include graphics describing how they were created in the lab. 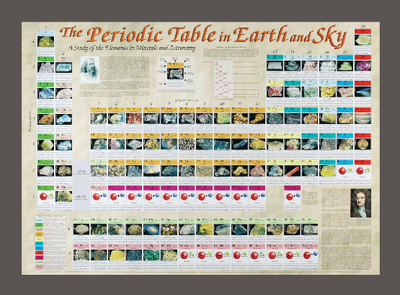 In addition, the elemental groups are color coded, and the information supplied for each element includes the name, symbol, atomic number and weight, electron configuration, mineral description, and text describing the element. The laminated chart includes a total of 117 color photos and graphics and comes with an information sheet.